The animal runs toward me, its curly tail wagging and its loving eyes full of joy. It jumps into my arms and nuzzles my face, like a dog. But it is not a dog. It is a fox—a fox that looks and behaves much like a dog. 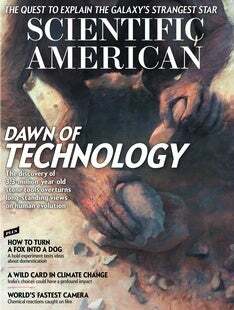 The animal and its close relatives are the result (as of early 2017) of 58 generations of selective breeding, performed in an attempt to discover in general the secrets of domestication and in particular how humans may have transformed wolves into the first dogs.